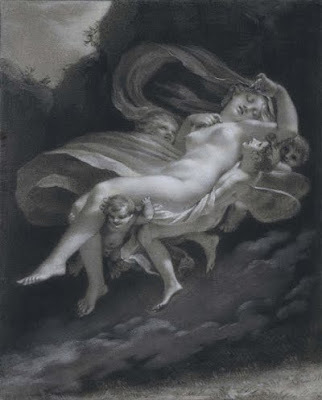 Drawing is the genesis, the connective tissue and the human hand most clearly present in art. The naked line and the smear of graphite link us most closely to out prehistoric cave marking ancestors. 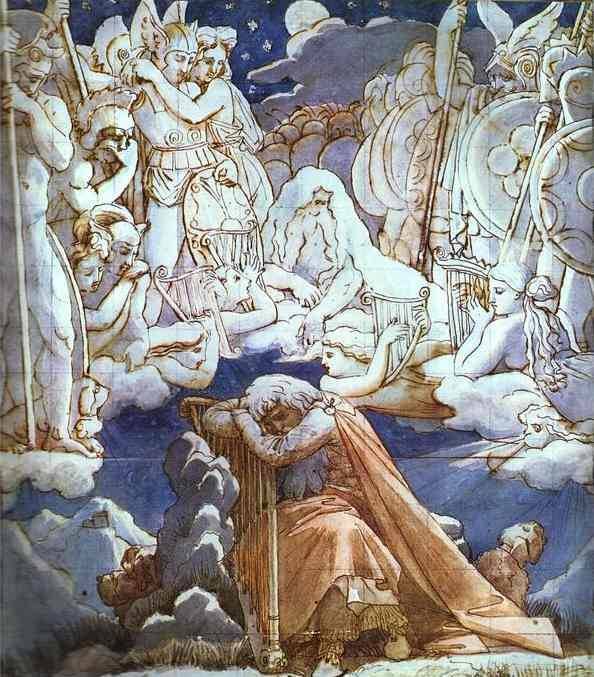 Drawing is like song, it is primal and familiar even when it is sophisticated or novel. It's no wonder that we react so strongly to it. It is an expression of pure being, the visual manifestation of thought onto a surface, drawing is more like language than art. 'David to Cézanne' at the AGNSW, a collection of French nineteenth century drawings, takes an interesting period of mark making and makes it seem wholly new. The bookends of the period are the icy neo-classicism of David and the over-familiar world of later Impressionism. It strikes me that both have audience problems. David, Ingres and Delacroix trouble us, the scale and sheer painterly virtuosity seem strange to our eye today, whilst Cézanne, Monet and Degas are as familiar as our family's faces despite being part of the most radical artistic rupture of the last two hundred years (I would argue that the schisms of Abstraction, Surrealism and Conceptual Art are far less monumental precisely because of the scale and ambiton and context of the Impressionist project). The drawings of these artists, the thinking left behind, the preparation, the studies, offer an interesting way to approach then anew. Scale is a the first thing that strikes us in the sensitively lit rooms. Drawing brings us into a direct human relationship with a work of art, even when the paintings we're familiar with are not huge their aura and reputations might be. Thus the big romantic gestures of Delacroix and the political geometries of David are made manageable. Seeing studies from the big academic painters like David, Ingres, Gericault and Delacroix is instructive. I don't imagine I'm alone in finding the early nineteenth century a period of French painting I find easier to admire than love. The paintings we know do feel like they're crying out for the electric jolt of the human. David's return to the classical is as much ideological as it is artistic, but he makes it hard to find a way in for humans. Banishing imperfection from society means removing asymmetry mess and clutter from art, the very things that we recognise as essentially human. It's hard to like let alone love. Unsurprisingly that sculptural regularity is here in the representations of Ingres too, although in paint it's more often hidden under folds and swatches of linen and silk. More of a shock is to see the difference in the sketches of the two big name Romantic painters included, Gericault and Delacroix. The sublime volume of Delacroix is absent here and instead we see something quite static. His studies reveal a painter twisting figures into compositions, building up blocks of elements that will eventually create a structure. That's no surprise but what was was the lack of movement. 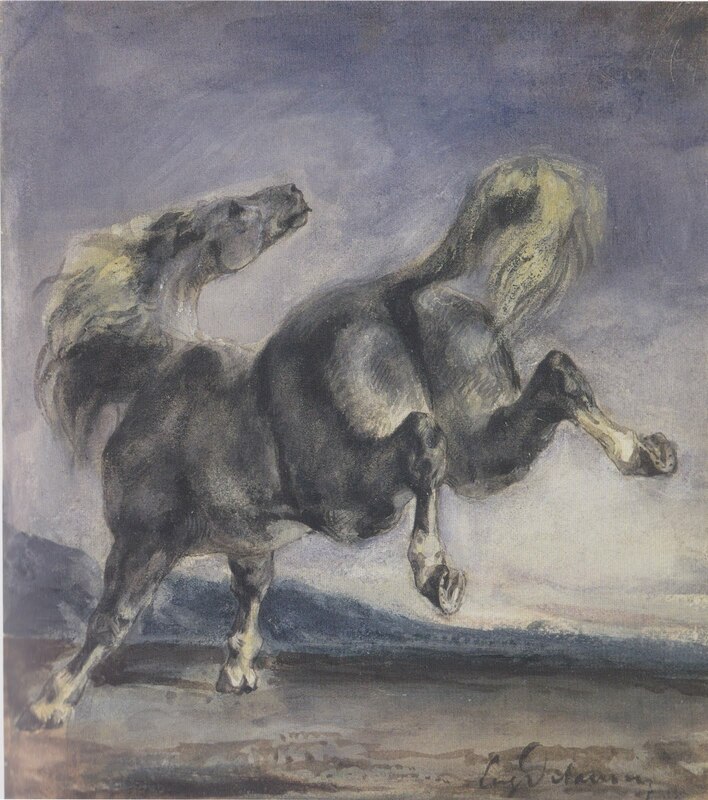 When we move from an image like that of the 'Bucking Horse' even it seems static, the twist of the head like a the extreme twist of a Michelangelo torso. It feels more marble than flesh and I wonder if this accounts for the discomfort I feel with Delacroix: there's a lot going on but it never feels real. 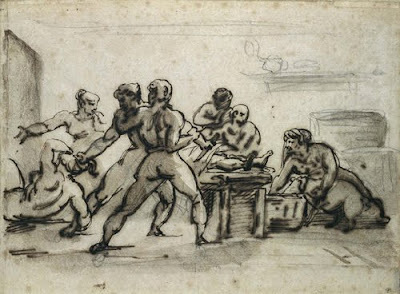 On the other hand the sketches of Gericault capture sense of movement, anticipated or otherwise. 'The Murder of Fualdés' is like a slash of movement from left to right. The figures don't just claim blocks of space or twist in shows of heroic tension, rather they seem to propel the eye across the paper and in doing so create an illusion of energy. This makes for a much more vital scene than Delacroix achieves, the composition assists the narrative and everything else is subservient. Perhaps Delacroix suffers from a similar problem to David, in trying to capture the romantic spirit of the sublime he is in effect painting an ideology, making that feel human and authentic will always prove nigh on impossible. Gericault doesn't have that problem, narrative might be contrived but it is familiar and it taps into real emotions and responses. Even when we move away from the big narratives it's easy to see something cinematic here. Before making that leap it's worth considering precisely what many of these drawings are for, they are studies or exploratory sketches for bigger works. That technical distinction ought not disqualify us from looking at them as sequential observations. Jean-Francois Millet's 'The Wool Carder', widely known in the form of an etching, is utterly extraordinary in this way. 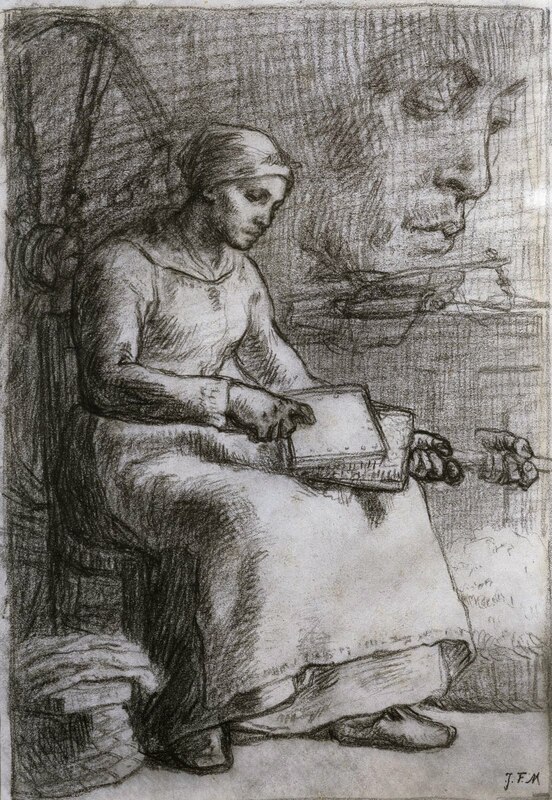 What we see on the paper is actually three images, the main picture of a statuesque woman at work grading wool, along side and over this are images of her hands and of her face. It is almost impossible to describe these without using the phrase 'close-ups' but as anachronistic as that is we can't help look at the woman, then at her face or her hands as if they had been intercut. Consciously or not Millet's shift from the general to the particular feels like a edited sequence from a film: A woman is at work, we cut to her calloused fingers teasing the wool and then to a close-up of her serene yet care-worn face. Of course it's illusory to look at Millet through the lens of cinematic editing but it makes the effect no less striking. As so often happens in exhibitions that revisit French art of the Nineteenth Century the depth, breadth and power of the work that spiralled off of the Impressionist experiment is underlined. This is never unwelcome. Familiarity can lead us to take this extraordinary period for granted. Here charcoal and crayon are used to create an impression, a smear of sentiment, a dark smudge of intense feeling. The formal innovations of impressionism often focus on its relationship to colour, to its optical restlessness as it sought to capture ephemeral light on things. Seeing these monotone drawings reminds us that the medium and the paper have a creative relationship, the crayon itself is like a haze that allows us to see. 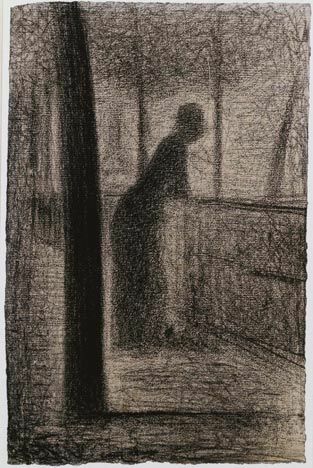 This is beautifully illustrated in 'Woman on a Parapet' by Georges Seurat. Mist or smoke or twilight seems to coalesce into form, as a woman looks over a railing and into the distance. The only truly dark solid form is a pillar in the left foreground, it makes the woman's shape seem all the more fleeting. The image is like a rumour or a memory, she appears and yet she may be gone soon. The woman, the skeletal trees in the background and the spray of light are only just there, the marks that hint at them rubbed onto the grain of the paper. It's a simple image but it has a meditative effect, light marks on paper promise deep interior life. Another image that stays once outside in the daylight is fully of burnt black dark. Albert Lebourg's 'The Artist's Wife and Mother-in-Law Sewing by Lamplight' captures the brilliantly mundane in a flash of dark. 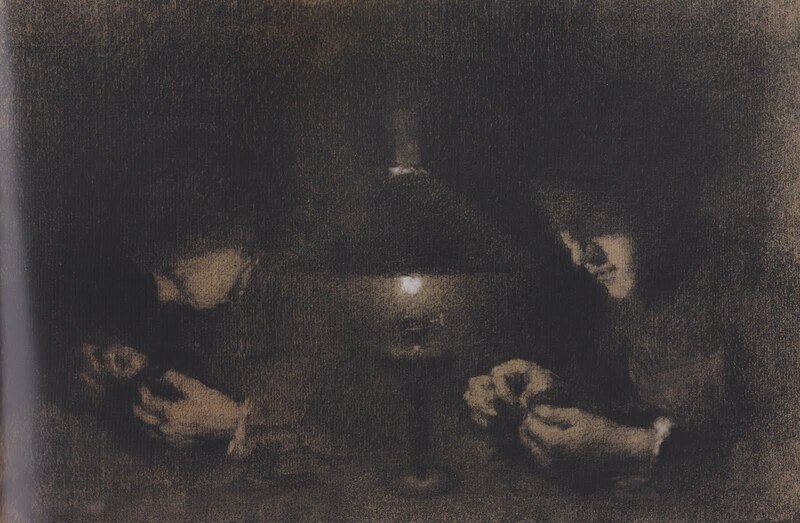 The two women sewing here are revealed only and precisely where the light of the lamp falls. 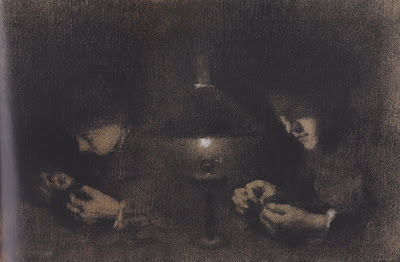 That focal point of illumination is the the strange centre of the image, it sits centre, middle and front a white hot filament of chalk, it isolates essentials, hands and lips and eyes downcast in concentration and gives a domestic scene chiaroscuro drama. The act of looking into the dark of this picture has a deeply empathetic pull, to concentrate and pick out features is to sew in the smoky half light with all the care and concentration that requires. It is worth pausing here to remember that Impression grew from the roots put down by Realism and that the dignity of humble labour is often one of its most compelling subjects. 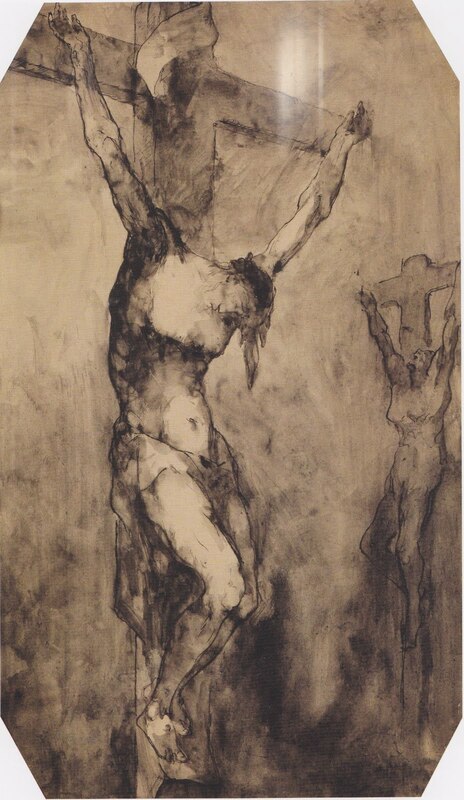 Without the necessity of monumental scale or the need for a brighter more varied palette many of these drawings find grace in their restraint. Drawn portraits can be a shift from painted convention. Often they are simply studies but this can give them the immediacy of photography as the artist seeks to capture posture and expression. This isn't to say that those are absent from their formal painted portraits simply that emphasis changes. The need to display clothing, the symbolic mise-en-scene and the attendant conventions, be they social realism or social status, in commissioned paintings changes the balance away from the minutiae of the sitter. The portraits here are interesting for their focus on the face. 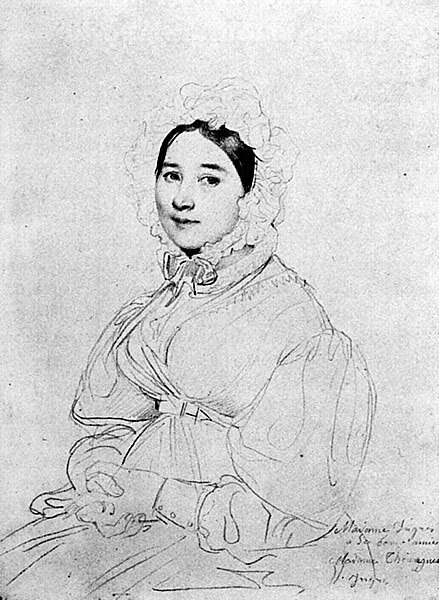 Ingres may have catalogued the French ruling class in it's Imperial splendour, laden in finery loaded with very specific meanings for sitters and viewers, but his drawings feel more psychologically compelling. The image of his wife here, only her face perfectly rendered in pencil, has the tenderness of the beloved and a sense of curious amusement that might never make its way into a formal portrait. In drawing artists appear to be seeking the essence and when this is human it's no surprise that we find these so moving. The realism that demonstrates itself elsewhere as a documentary record of labours also forces itself out off of the paper in the strikingly modern portrait of the 'Head of a Woman' by Henri Lehmann. The crease of her brow and the straggle of hair is unusual enough but the kiss of red chalk on blue paper gives blood to the face and a light touch makes her fleshy rather than formal. 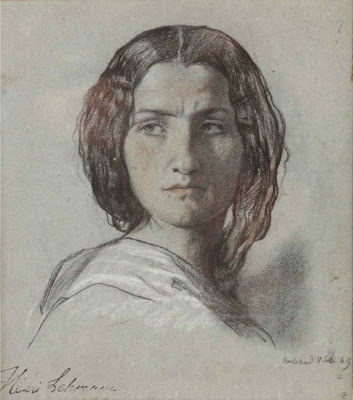 As this is a sketch Lehmann isolates the face so that we can't see period context of clothing. This purely practical feature gives us a shiver of recognition one hundred and fifty years later, it allows us to look at a woman of our own time, someone thoughtful, perturbed, alerted. That surprising immediacy might be what makes this show so effective within its quite modest scope. This is so far from a blockbuster, but that's not a criticism. Over the last year or so I find myself happily immersed in modest but thoughtful shows at the AGNSW. The pleasures are often cerebral and contemplative, beauty can be found in connections and in quiet pieces waiting to be considered quietly. The AGNSW has stumbled a little with its blockbusters (Rupert Bunny anyone?) but with shows like this it does something of far greater value than simply rolling out celebrity crowd pleasers. I'd love to see serious shows of Mantegna or Zurbaran or Cassatt or Sickert or Twombly (well I can hope) but in their absence I like this public service curating and look forward to more suprising gems.